I received a request on my recipe for butter croissants to do a photo tutorial. I have to admit, the recipe can look quite daunting when printed in black and white (almost as daunting as the history outline I should be writing now). But I have made croissants numerous times using this technique and every batch has been golden, buttery, crunchy and delicious. In fact, I think croissants are easier (there I said it) than making regular yeast bread. The dough proofs overnight in the fridge, and I don’t have to worry about all the yeast-y terrors that come along with counter-top rises. b) it looks kind of vintage-y and Parisian, you feel? I hope this tutorial makes the joy of croissantery (is that a word? now it is.) more accessible. 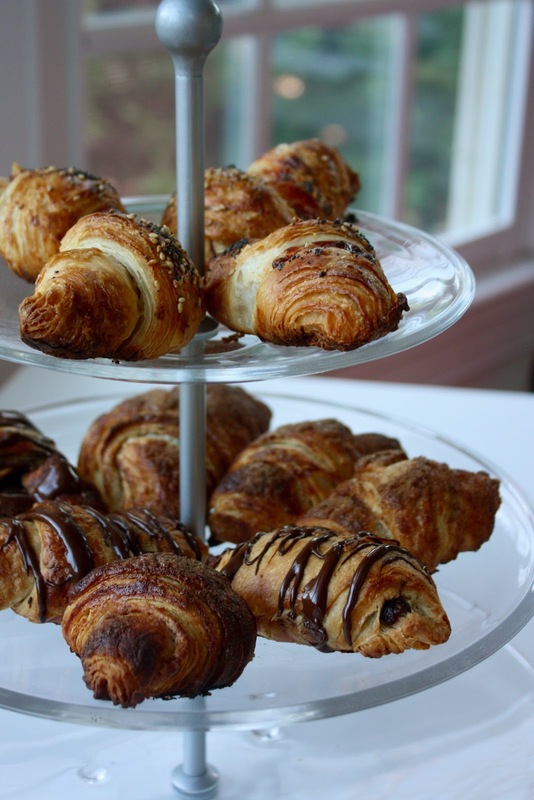 There is no satisfaction greater than biting into a perfect, crisp croissant that you baked yourself. Combine all of the dough ingredients in a stand mixer fitted with a dough hook. Mix on low speed for 3 minutes, and medium speed for an additional 3 minutes. Place the dough on a lightly floured plate, wrap well in plastic, and refrigerate overnight. Top with another sheet of parchment and pound the butter with even strokes with a rolling pin — or if you’re like me and lost your rolling pin, a bottle of balsamic vinegar :). As the pieces begin to stick together, use more force and roll it into a 7.5×7.5 inch square. Trim the edges off and pound them into the center of the square. Refrigerate while you roll out the dough. Unwrap the dough and lay it on a lightly floured surface. Roll it into a 10.5 inch square. Take the butter square out of the fridge and unwrap and place it on the dough so that the points of the butter square are centered along the sides of the dough square. Fold the flaps of dough over the butter and press the edges together to completely seal the butter inside the dough. Repeat this rolling and folding process 2 more times. 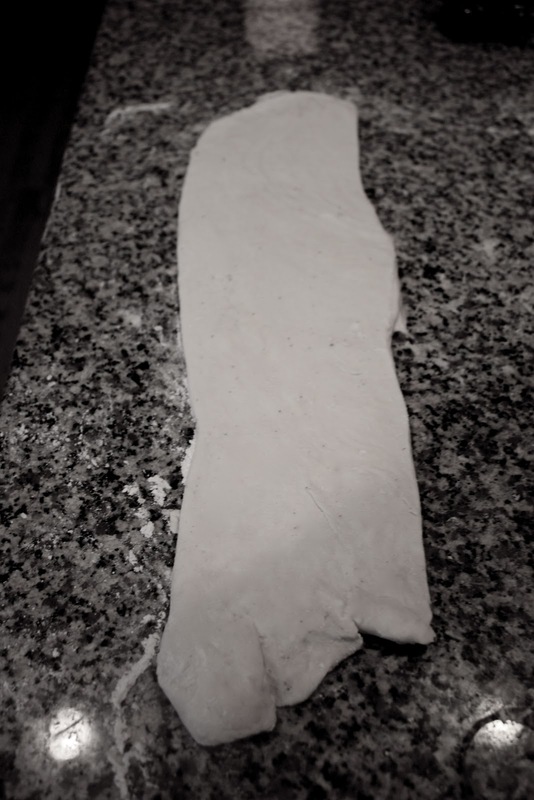 After you’ve done that rolling and folding process a total of three times, roll the dough into a long and narrow strip (8×44 inches) *hang in there! its a great arm workout! Repeat the folding, freezing, and rolling process 2 more times. After, roll into a long, 8×24 inch rectangle! Add the fillings of your choice, and roll that baby up! And pop the baking sheet in the fridge overnight! In the morning, preheat the oven to 425 degrees Fahrenheit. Take the croissants out of the fridge and brush with a second egg wash.
Be sure to take lots of pictures so you can show off to your friends later! Thank you! I was going to do a pain au chocolat, but then I figured Nutella is even better than dark chocolate! The hazelnut really adds something to them! I love the tutorial! How do you post gif's? I just googled "gif maker" and you can upload your snapshots and it will make them into a gif! Yum. Can't wait to make this. 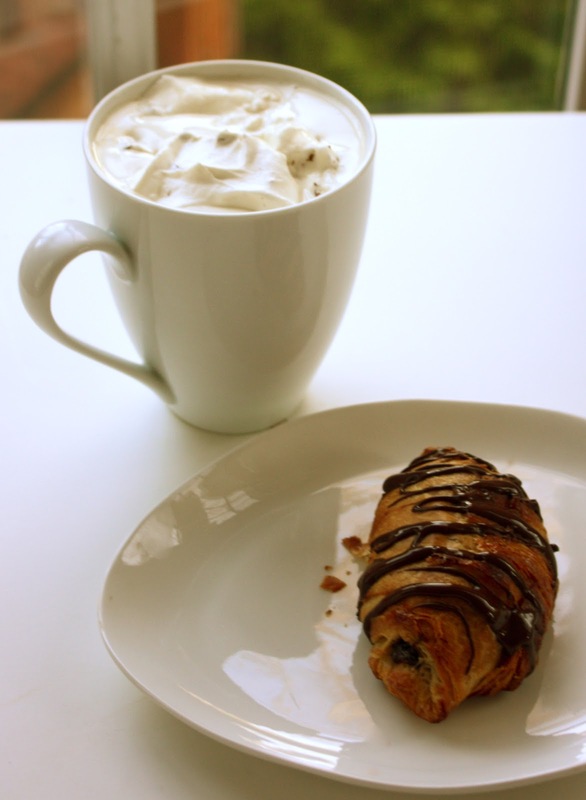 I love going to the local cafe and getting croissants in the morning, but making it seems better to me. This is so fancy. 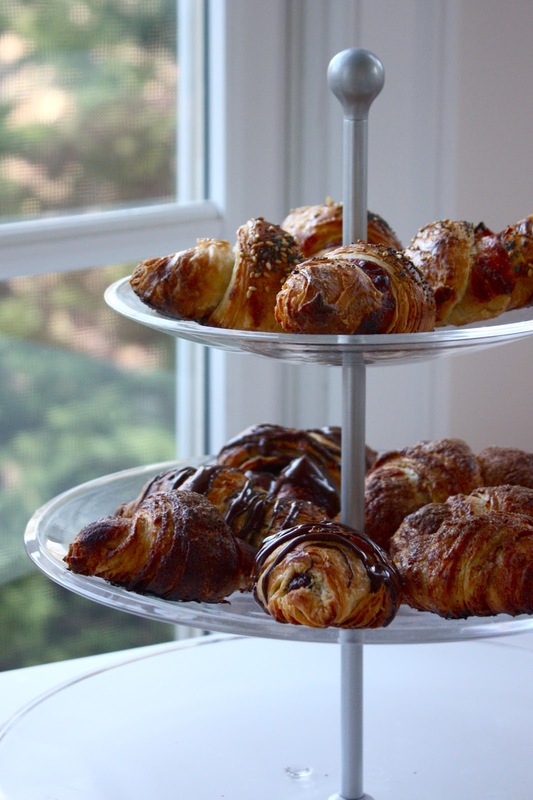 Also…um I want to stuff my face in the nutella croissants, asap. And the beating the butter looks like something I'd be sure to royally botch up. Beating the butter isn't too bad — it's actually a great de-stresser! These look great! Do you freeze the dough for 20 minutes each time you roll and fold? Thanks for the help! Thanks! Yes, you freeze after each "turn" of dough (rolling and folding). I'm making these right now! when you say overnight, does that mean roughly 12 hours? because I'd like to have these for dinner tonight… Thanks for the recipe and awesome tutorial! 12 hours would be perfect! Tell me how they come out! Well, they looked good when they came out, but were raw in the middle! Im so sad… im not sure what i did wrong. Did I make them too thick? Oh no! You probably made yours a little larger than mine! Try cooking them for longer! Hi dear, the highest temp for my convection microwave oven's only 250 degrees. Im newbie in baking, pls help! The temperature is really crucial right? I've tried few times but none is successful. Wouldn't wanna use premix as I prefer to do it from scratch. Thanks for replying anyways! These look wonderful, Erica, in fact my mouth is watering as I type! 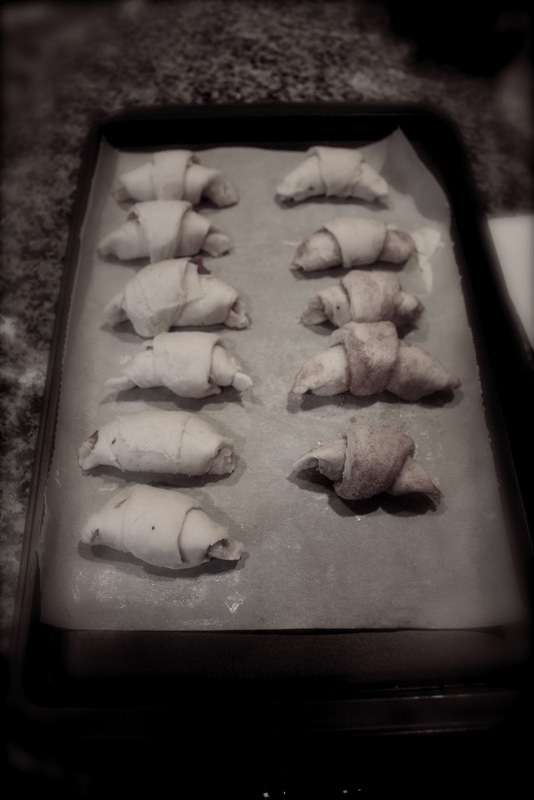 About how many do you get from a recipe of croissant dough? Also, home made nutella is even better than the stuff you buy; Much more wholesome and satisfying. This makes about a dozen, depending on how large you make them! I will have to try making my own Nutella someday! That sounds delicious! Do you have a recipe you recommend? If you haven't found one yet, I have used this recipe with coconut milk and maple syrup with amazing results. Just add cocoa powder/maple syrup to taste until it is to your liking. That sounds so good! And kind of healthy too! 🙂 Thanks for sharing! Ok, so: roll-fold-freeze; roll-fold-freeze, roll44-fold-freeze, roll-fold-freeze, roll-fold-freeze, roll-cut-fill-wash-fridge, bake? Wait, so are you suppose to cut into triangles when its 8×44 or when its 8×24? because on your other directions for croissants it says to cut it when its 8×44. Sorry, I'm just really confused, and I don't want to mess these up again.